The NARHAMS model rocket club serves Maryland and the Washington Metropolitan Area. The club is an official chapter section of the National Association of Rocketry (NAR). First established in 1965, NARHAMS is the oldest continuously operating model rocket club in the United States and was named Section of the Year for 1997, 1998, 1999, 2001, 2004, 2006, and 2007. We are also the National Championship section for 2001 and 2004. If a launch is postponed or cancelled, it will be updated here by 6 pm the day prior. Launch is assumed to be a GO unless otherwise noted. Saturday July 20, 2019, 12:00 p.m. to 4:00 p.m. Celebrate the 50th anniversary of the historic Apollo 11 moon landing. Attempt to land your model rocket nearest the center of a "moon" drawn on the ground. 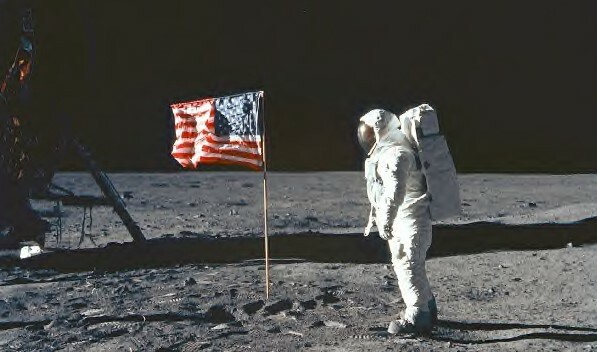 We will distribute free commemorative "moon landing" items to the first 200 contest registrants. Trophies and model rocket kit prizes will be awarded to the top youth and adult finishers. A narrated demonstration launch of models of historic NASA space vehicles will take place before the contest. The contest is free. On-site registration is required on contest day. You must bring your own rocket and motors, or purchase them at the nearby Goddard Gift Shop. An awards ceremony follows the contest. For more contest details download the contest flyer. NASA Goddard Visitor Center: 301-286-8981 Tuesday to Friday 10:00 am. to 4:00 p.m. Persons interested in helping out the section by volunteering to provide meeting refreshments or to serve as Launch Manager for any of our open Mt. Airy launches can contact President Alex Mankevich. You can also volunteer your services during any of our business meetings. We also welcome anyone to lead a topic of rocketry interest as a theme prior to the start of the business portion of our meetings. Club launches are held on the third Saturday of every month, weather permitting, at Old National Pike Park in Mt. Airy, Maryland. The field can support up to G-powered motors with the appropriate FAA waivers. Launch times vary throughout the year, so be sure to check the Calendar for details. Our launches are always open to non-club members who wish to fly. NARHAMS provides launch controllers and pads with 1/8", 3/16", and 1/4" rods, as well as 1010 and 20mm rails. NARHAMS also supports the oldest public demonstration launches in the United States. These launches are held on the first Sunday of each month at NASA's Goddard Space Flight Center, starting at 1 pm. Anyone who wishes to fly at these events may do so. Due to the limited recovery area, the flying of high power models and untested designs is discouraged. The impulse limit at Goddard is D engine or less. Meetings are usually held on the first Saturday of each month, starting at 5:30 pm, at the College Park Airport. The first part of the meeting will be a building session or discussion. The business meeting will start around 7 pm, and will end around 9 pm. Any leftover items will get discussed over a late dinner at Ledo's. Need to stock up on some officially licensed NARAHMS logo gear? Check out our online store! If this sounds like fun, why not become a member? Dues are only 10 cents a week, with 50 cents minimum required to join. Download the membership form and send it in today! The NARHAMS-members Yahoo group is primarily for NARHAMS members to discuss upcoming events related to the club. Non-club members are free to join in the discussion, but please keep the postings at least somewhat related to model rocketry.